After posting my Axis & Allies: Guadalcanal, someone let me know that Hasbro issued some errata and the reinforcement points should have been twice as many as stated in the printed rules, i.e. 10 + 4 per island. That would have made a big difference as we could have bought a lot more reinforcements during the game. Hasbro’s web site says you can play it either way (with the double reinforcement points or without) so my review is of the game without that ammended rule as we played it using the rules as stated in the box. Please keep this in mind when you read the review. Now I know the errata says we should have received double the amount of reinforcement points that we did, I can see that this would have made a big difference as we could have reinforced properly and our forces would have diminished much less. 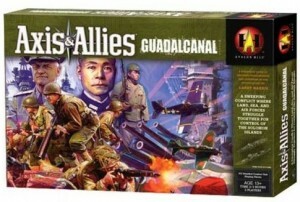 I’m not sure it would solve all the issues in the game and I’m not convinced it would mean it would be better than its siblings (D-Day or Battle of the Bulge); however, I think it would have been better than it was and could make a bit more sense to the ratio of pieces included in the box. I’ll write a revised review when I play it again using the proper rules, although that may not be for sometime. Such a shame a game could have such a major error in the rules. I really should check the Hasbro/Wizards/Avalon Hill web site before playing their games from now on – the original version of ‘Betrayal at the House on the Hill’ I have (and played) had so many errors and incomplete rules in it that the errata they released was about the same size as the rules! Also, thanks to the person who let me know about the rule error too. 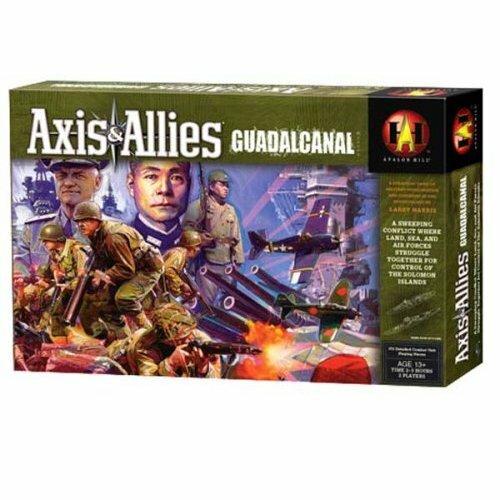 Axis & Allies: Guadalcanal is one of the three 2-player Axis & Allies games – the others being D-Day and Battle of the Bulge. Each game has completely different rules to the others and all have different rules compared to the main Axis & Allies game too. Earlier this year, my friend Matt and I decided to start playing some games that are connected to their anniversaries so we played A&A: D-Day on June 6th. As I like A&A: D-Day and Battle of the Bulge, I picked up a second-hand copy of Guadalcanal to play in August (anniversary of the start of the Guadalcanal conflict).